With the opening of the newly dually A11, also comes the opening of a new underpass next to the Elveden memorial and some associated changes to the Public Rights of Way network. 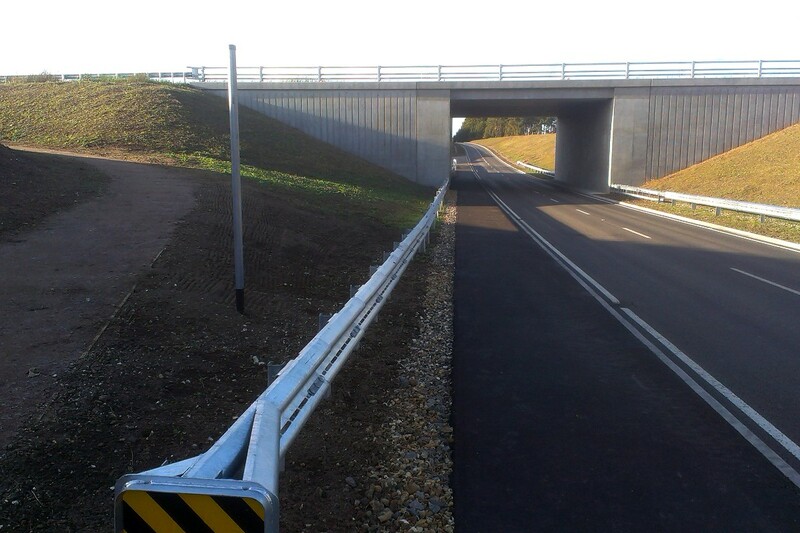 The new A11 underpass by the Elveden Memorial. Icklingham BY 7 has been stopped up between the junction with Icklingham BY 6 at the north-west corner of Berners Heath and the A11 at the Memorial. A new Public Bridleway (Icklingham BR ?) runs along most of the old route, but ends at the underpass, rather than joining the A11. 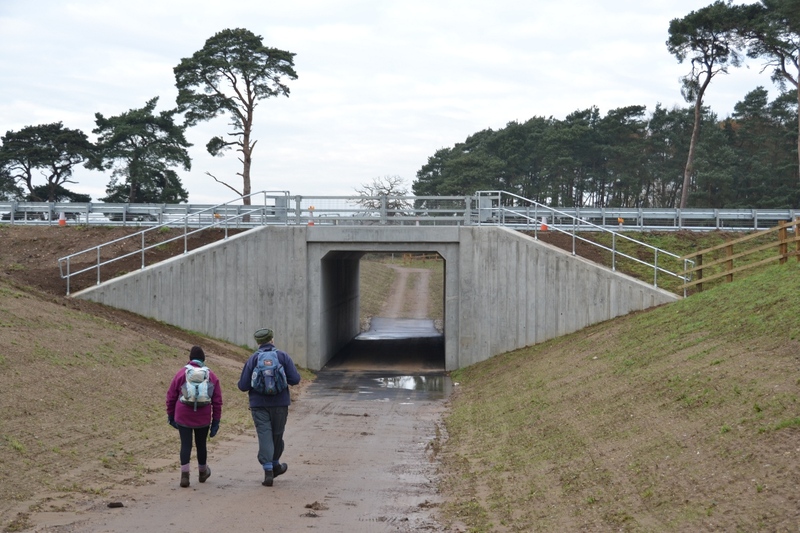 New Public Bridleways (Elveden BR 7 and BR 8) have been created passing through the underpass at the Memorial. 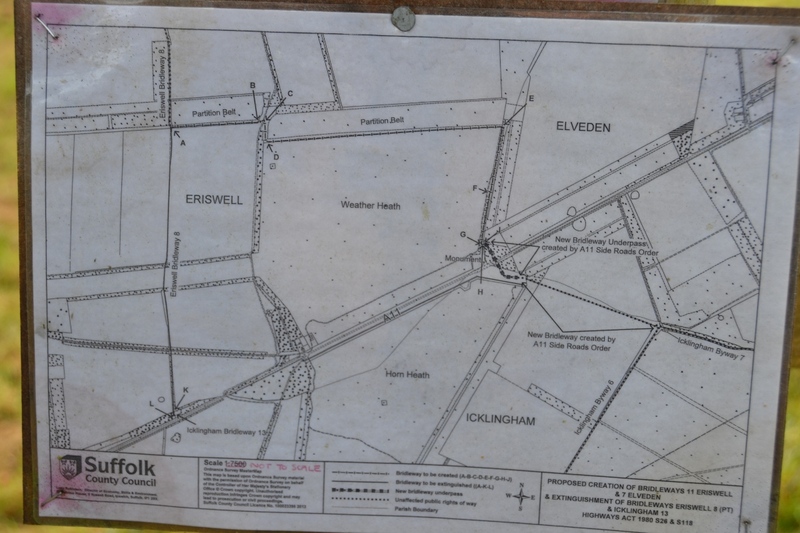 A new Public Bridleway (Eriswell BR 11) has been created following the eastern and northern edges of Weather Heath, and then continuing west to join Shakers Road (Eriswell BR 8). The section of Shakers Road (Eriswell BR 8 and Icklingham BR 13) between the new Bridleway and its old junction with the A11 has been stopped up, and so is no longer a public right of way. You can view the Creation Order for Eriswell BR 11 and Elveden BR 7, which includes descriptions of those new routes, and a map is shown below. (The other changes were made by a DfT Side Roads Order as part of the main A11 works.) You can also see the detail of all the new routes on OpenStreetMap. Council map showing the new routes. Public Bridleways provide a right of way for the public on foot, horseback and by bicycle. They must be maintained in a suitable state for pedestrian and equestrian users, though not necessarily for cycle use. Nevertheless, these changes now provide a useful new route for cyclists without having to cycle along or cross the A11. The new Rights of Way provide a continuous route from Thetford Forest along Shakers Road, through the underpass, and then either south to Icklingham or north-east to Thetford. The surface of new route should be ok for use on an off-road bike, though it may be hard going in places. The fenced in section round Weather Heath is nice and wide — 4.5m according to the description in the Definitive Statement. The new Public Bridleway along the north edge of Weather Heath. There’s no cycle or pedestrian link parallel to A11 between Memorial and Elveden village. 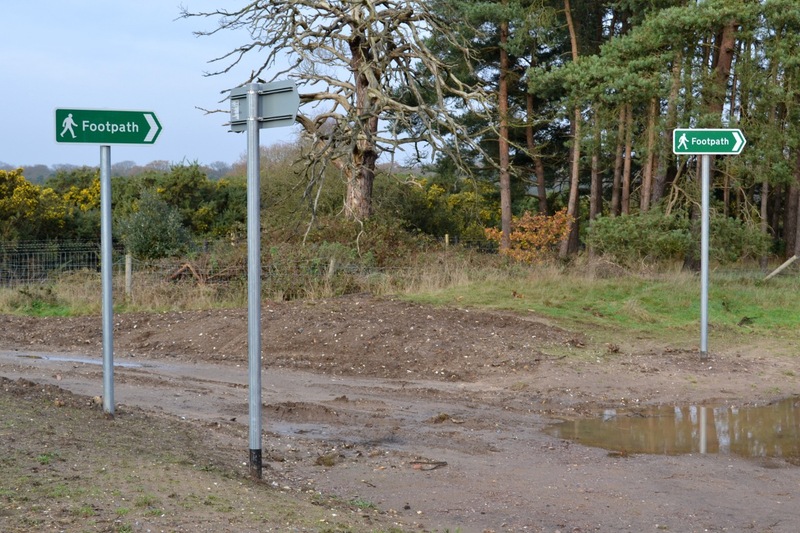 There’s a service road for the Elveden Estate that could be used, but it’s a private road not open for public use. The signing by the Highways Agency around the new underpass is rather over-the-top and spoils the natural environment. Large green road-sign style signs have been used, rather than more fitting roundels or finger-posts, and far more signs than would be necessary have been used. An example of the excessive and obtrusive signage provided by the Highways Agency. The surface of new Bridleways is not ideal for cycling; bumps and vegetation growth may be tiring around Weather Heath. It also may get overgrown, and it’s not clear how committed the council will be to keeping it well-maintained. The barbed wire on fences either side of Eriswell BR 11 around Weather Heath, could be dangerous. 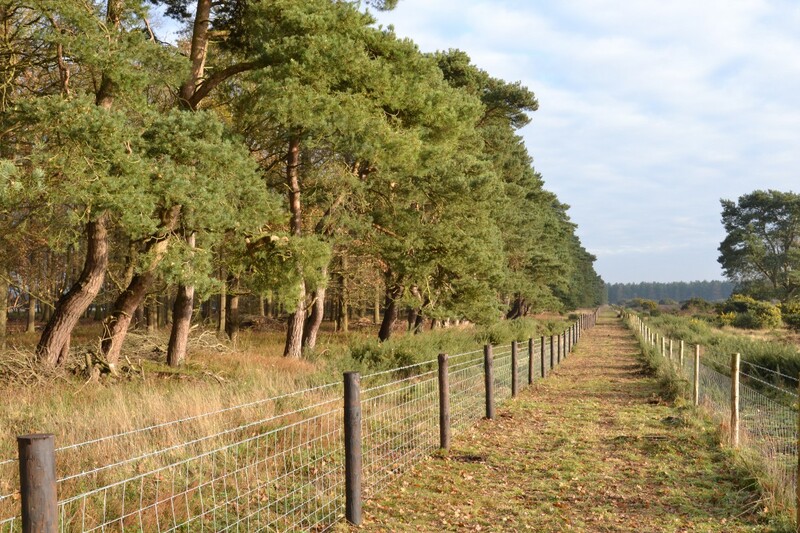 Fortunately the wire is mostly on the outside of the posts, but there is one section a few hundred meters long where it is the other way round (a pre-existing fence along the heath boundary). 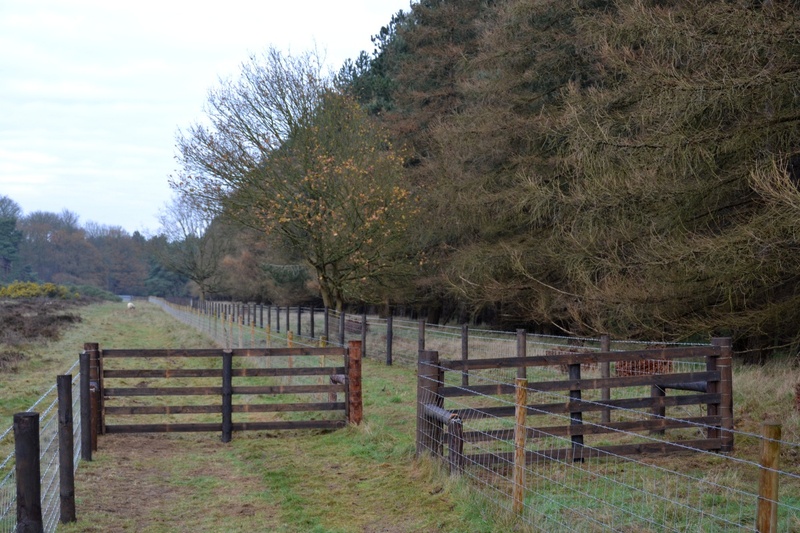 The new Bridleway on the east side of Weather Heath, showing the barbed wire on the wrong side of the fence. It would appear that the changes to the Rights of Way may have inadvertently cut off any lawful access to Horn Heath. The only access point I’m aware of is a kissing gate from the stopped up part of Icklingham BY 7. Users now need to trespass on the private estate road to access this from Icklingham BR ?. No cycle parking has been provided for those wishing to arrive at the memorial by bike and then explore the access land on foot. Though presumably one could lock bikes to the fence posts. There’s no easy access to Weather Heath at its north-west NW corner, which is now passed by Eriswell BR 11. There is a field gate there, but it was padlocked shut when I visited a couple of weeks ago. On the section of Eriswell BR 11 west of Weather Heath, there are some overhanging branches, which will probably obstruct horse riders. The final cones were removed and the completed dual carriageway of the A11 between Thetford and Barton Mills was opened today. This is great news for motorists and local businesses, but how will it affect cyclists? The Thetford Area Action Plan contains proposals for a number of Cycle Loops from Thetford, and the Highways Agency have recently been instructed to ensure that all their new schemes are cycle-proofed, but has this scheme delivered any improvements for cyclists? To be fair, it was never pleasant or safe to cycle along or cross the old A11. But rather than looking at whether there has been a net improvement, we should perhaps be looking at whether the scheme took advantage of numerous possibilities for improvements. A dual carriageway inevitably forms a linear barrier to cycling, so it’s important that there are sufficient locations where it can be crossed safely. There are three key places where crossing points should have been provided. One has been done well, one acceptably, and one neglected completely. At the Elveden Memorial, there is now a multi-user underpass (map), allowing safe passage for pedestrians, cyclists and horse-riders. This has been linked in to the Bridleway network by a new route around Weather heath. For further details see this following post. Multi-user underpass by the Elveden Memorial. At the northern end of Mildenhall Woods, new paths link Icklingham Public Footpath no. 2 and the end of the C616 opposite to the B1112 underpass (map). It’s a bit of a detour for anyone wanting to cross there, but it’s better than nothing. B1112 Underpass, with connecting paths to Midenhall Woods. Finally, at the Thetford end of the new dual carriageway, it was planned for one of the Thetford Cycle Loops to cross the A11 just south of the Rifle Range (map). No provision has been made for a crossing point here at all. Thetford Forest is now severely cut off from the Town of Thetford by the A11, which represents a great loss of amenity. Shame on Breckland Council and ‘Moving Thetford Forward’ for not raising this issue with the Highways Agency (now Highways England) during the planning phase. The only realistic possibility for the future would be if traffic lights are installed at the Sainsbury’s roundabout, and included pedestrian and cycle crossings. For those wanting to travel parallel to the A11 it is another mixed bag of results. The good news is that there is a new high-quality cycle path on the south side of the new road linking the Thetford roundabout (map) with the old A11 north of Elveden (map). This provides a good route from Thetford to Elveden. Or at least it would if there was a suitable way to get from the centre of Thetford to the start of the cycle path. The access to the new route is along London Road in Thetford, which has a 40mph speed limit and is a principal lorry route to two industrial estates. So not suitable for cycling. Norfolk County Council say they have no plans for adding any cycle infrastructure to the road. It is most disappointing that such provision was omitted from the A11 Scheme. At the other end of the new cycle route there are also issues with how users are expected to re-join the carriageway, which I have written about previously. Further south, it is also inexplicable why a cycle route was not provided between the old A11 through Elveden (map) and the Elveden Memorial (map). 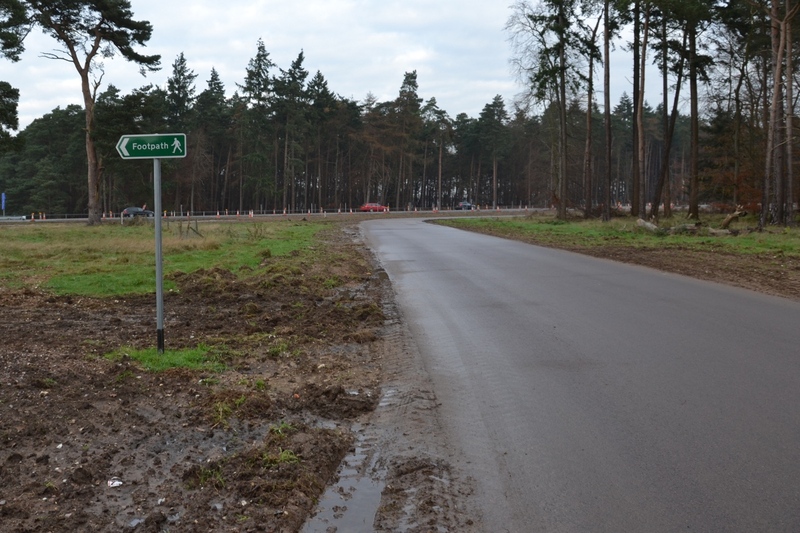 A new high-quality tarmacked service road has been provided for the Elveden Estate precisely along this route, but as far as I know it is not available for public use. I don’t understand why it could not be opened up, as it was presumably publicly funded, will probably carry little traffic, and is wide enough to allow two vehicles to pass safely. Another fail from the planners I feel. Private service road for the Elveden Estate. While there is some good news from the scheme (notably a new route between Thetford and Elveden, and the new underpass at the Elveden Memorial) on the whole the scheme seems to be dominated by missed opportunities. We’re told that the works came in under budget. It’s a shame some of the unspent cash couldn’t have been used to allow more provision for cycling.